Donate in Honour of your favourite dog Lover! Are you looking for a unique and thoughtful way to give a gift to someone you care about, who loves dogs? 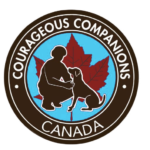 Consider donating to Courageous Companions in honour of your favourite dog mom or dad. With a minimum donation of $25, we will send a hand-written card for any occasion! Just click on the “Donate Now” button at the top of the page. This will take you to the Courageous Companions online donation platform via Paypal. Be sure to include “Special Instructions” with the name and mailing address of the individual to whom you would like to send the card, and for what occasion. Please note that we can only issue charitable receipts in the name of the individual who donated. We cannot issue charitable donation receipts “on behalf” of another individual. If you would like to obtain a charitable donation receipt with your holiday card donation in honour of someone else, the charitable donation receipt will be issued in the name of the donor. Courageous Companion service dogs are provided at no charge to our Veterans and First Responders. We rely entirely on donations from individuals, businesses and service organizations like yours. As a 100% volunteer driven organization, we rely on donations to maintain our program. We also have the advantage of keeping administrative costs very low, as our team of dedicated volunteers are the backbone of the organization! Together with your financial support, we can provide more services to our injured Veterans and First Responders. Your donation will be used to help rebuild the lives of those who have sacrificed for all of us. A service dog typically takes 12 – 24 months of full time training and depending on the number and complexity of symptoms costs a minimum of $20,000 to train. Courageous Companions is grateful to the partnership of MSAR Service Dogs in Manitoba, an independent non-governmental organization founded by First Nations. A charitable donation tax receipt will be issued to you after your cheque has been deposited and cleared. One manner that you may choose to donate to Courageous Companions is via Payroll deduction through your employer, or via the Government of Canada Workplace Charitable Campaign (GCWCC). Together we can give our Veterans and First Responders a chance to live whole again in our community with their heads held high. In our business we like to say “injured, not broken”. Thank you for choosing to help support the work we do here at Courageous Companions!